Water Detector and Sensor Tape is designed for dependable detection of water presence even of low conductive liquids. A few applications include telecommunication facilities and computer rooms. Water Leak Detector protects equipment from water damage by detecting the presence of water in drip pans or in air handler units. Applications include radiant floors, data centers, sump pumps, and drains. 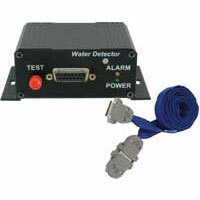 Water Leak Detector offers affordable and dependable leak detection. Ideal for any application where a flood or water leak is likely to occur. A few applications are leak detection and pipe burst notification.